The introduction of the Moto2 class into the world championship in 2010 was met with mixed emotions. Moto2 spelled the end for the beloved 250cc two-strokes, but it also opened up a new world for engineering innovation. Based around a spec Honda CBR600RR engine, the essence of the class was to have brilliant minds develop a chassis around it to lap a racetrack the quickest. Instead of hunting for horsepower, emphasis would be placed on engineering excellence and rider talent to win races. By most accounts, the series is a success. The racing is extremely close, Moto2 machines are faster than their 250cc two-stroke predecessors, and the past two champions, German Stefan Bradl and Spaniard Marc Marquez are acclimating well to MotoGP competition, especially Marquez. However, dig beyond the surface and a trend is already starting to emerge. Bradl won his championship in 2011 aboard a Kalex chassis. His only real title contender that year was Marquez aboard a Suter chassis. Between them, they won 12 of the 18 races that year. The following year, with Bradl graduating to MotoGP, Marquez made the rest of the field look like amateurs while he piloted his Suter to the 2012 title. 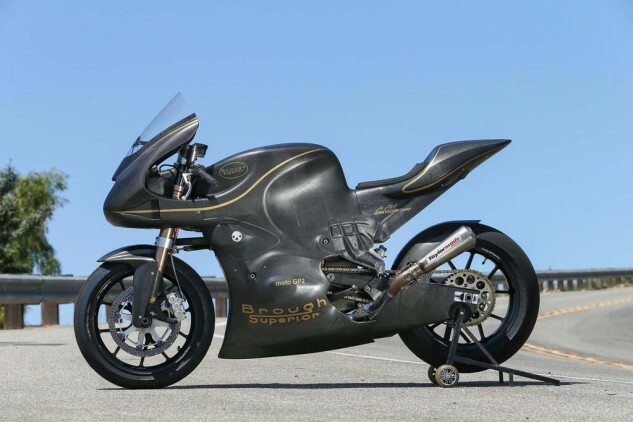 Coming soon to a Moto2 grid near you, the Taylormade/Brough Superior Moto2 racer. That kind of dominance convinced much of the competition that either a Suter or Kalex chassis was the one to be aboard, effectively killing the notion of chassis development from several different fronts. At the 2013 season opener in Qatar, more than half of the field was made up of one of these two chassis. As of this writing, after 17 of 18 races this year, a Suter or Kalex has won every single Moto2 race. Paul Taylor and his business partner, designer John Keogh, also saw Moto2 as an open playing field they believe suited their particular strengths. Taylor, the name behind LA-based exhaust manufacturer Taylormade Racing, has long been a tinkerer, fabricator and motorcycle enthusiast. Keogh, meanwhile, has a design and engineering background, having previously worked at both Triumph and Buell. Neither had any interest in designing a new engine, so the spec Honda unit opened their creative floodgates to create a chassis around it. And hence the Taylormade Moto2 project was born. 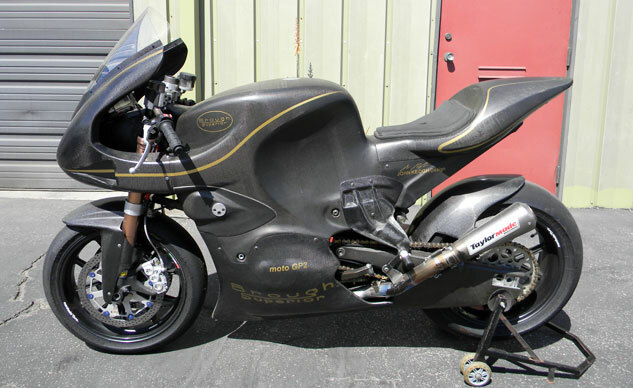 Some may consider it ludicrous for two guys in a small shop in Los Angeles to challenge the might of two established chassis builders in Suter and Kalex, but that doesn’t deter either man. They just want to bring creative thinking back into motorcycle racing. Unconventional thinking, like a monocoque chassis constructed entirely of carbon fiber, a rear-mounted radiator, and A-arm front suspension are just a few ways Taylor and Keogh differentiate this bike from the rest. Weight is also the enemy, so a focus on lightness emerged. Next they wanted a racing motorcycle with 50/50 weight distribution with rider onboard. And as you can imagine, the flood of ideas started to snowball, one on top of the other. The result is what you see here. When viewed from the top looking down, the shape of the bodywork is asymmetrical. It is shaped around the right engine cover, which protrudes outward more than the left. The best place to start with the Taylormade Moto2 is the carbon fiber monocoque chassis, which uses the CBR600RR engine as a stressed member and meets the goals of being lightweight and extremely strong. As a general rule, Taylor said, each component of the motorcycle would have to perform at least two functions, preferably more. Maintaining the narrow-first mentality, Taylor likes to say the engine is “shrink wrapped” by the bodywork, and I can confirm this tight packaging as I was barely able to slip a finger between the fairing and the engine case. The term monocoque, when referring to a motorcycle chassis, is a trendy phrase these days, made popular lately by Ducati, first in its grand prix motorcycles, and later in the 1199 and 899 Panigale models. However, according to Keogh, these aren’t true monocoques. “On the Ducati grand prix bikes, the airbox was also a structural member, the old John Player Norton that raced in the TT was called monocoque but the bodywork came off, and Kort Ballington’s [KR500] Kawasaki from the early ’80s, again the tank came off. So by definition these aren’t monocoques. Even the Britten wasn’t completely a monocoque,” Keogh says. A distinctive feature, the rear-mounted radiator frees up space at the front of the bike without the front wheel and suspension obstructing the cool air’s path to the radiator. Note the substantial rear wheel hugger to prevent potential damage from debris being kicked up by the tire. “This bike [Taylormade Moto2] is simple and has very few pieces,” Taylor continues. “Just the monocoque, swingarm, two pieces of bodywork (nose and tail piece), front forks, radiator, then the engine.” If maintenance work is required on the engine, they’ll actually support the engine, then pull the entire monocoque off the top. A distinctive feature of the Taylormade Moto2 is the rear-mounted radiator. Moving it to the back meant the engine could be mounted 50mm forward, which then helped with the 50/50 weight distribution they were after. Another benefit of radiator relocation was fresh air not being obstructed by the front wheel, meaning it was possible to use a smaller radiator. A fresh charge of cool air enters through the giant duct that takes up almost the entire nose of the bike (it swallowed my entire open hand). One of the main disadvantages of a conventional fork setup is stiction – when the fork tube does not compress and release in one fluid motion. This is especially true at extreme lean angles. Taylor and Keogh felt they could gain their advantage by separating the braking and suspension forces, incorporating a BMW Telelever-style front end with an A-arm mounted to a carbon composite structure attached to the CBR’s cylinder head. An inverted fork measuring 43mm is used, with Traxxion Dynamics gas cartridges inside, “so tuning of the fork is very conventional.” The difference between Taylormade and BMW, however, was making the front feel as close as possible to a conventional fork. 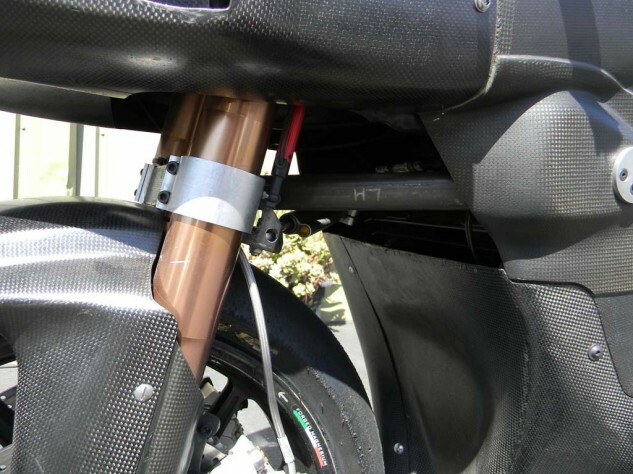 Taylor and Keogh employ a similar front suspension system to the BMW Telelever, with a front A-arm complementing a set of fork tubes to separate braking and suspension forces. This setup allows a steep rake angle and considerably softer springs while maintaining a similar front end feel as standard forks, says Taylor. Taylor says this bike will still dive when braking, just not as much. “The A-arm mitigates the weight transfer, but we designed it so the braking forces still compress the fork slightly. We then run 25% lighter fork springs because braking forces have been reduced drastically, and this provides the feel most riders are used to at the front.” Just how soft are the springs? A one-finger tug on the bar raised the bike a solid half inch or so before gravity quickly brought it back down to its static position. Fork dive can be controlled by the A-arm pivot angle. 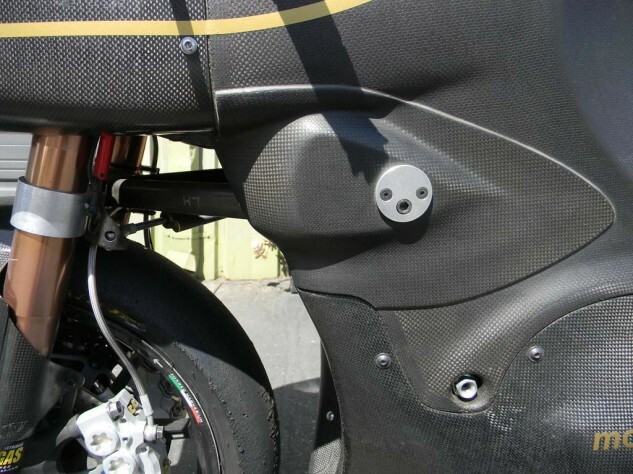 The plate grafted to the side of the fairing was added to extend the range of adjustability because Taylor’s test rider, Shawn Higbee, had reached the limits of the original design. Rear suspension is more conventional, with a Penske shock handling bump control in the back. 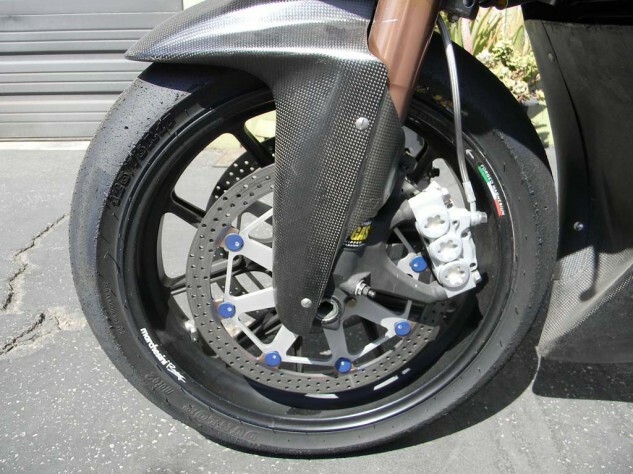 The swingarm, too, is completely carbon composite. During early testing, Higbee was experiencing violent chatter that wouldn’t improve no matter what was changed. Fork tubes feature internals from Traxxion Dynamics, while Swedish firm ISR provides the six-piston brake calipers. Dunlop provides tires for the entire Moto2 category, and in this application they sit on forged magnesium Marchesini wheels. When modifying the original swingarm to dial out the twist, Taylor simply added more and more carbon until the desired stiffness was reached, “but that’s not taking advantage of the material,” he says, noting adding more material also adds unnecessary weight. “What you want to do is spread the load over a large area of fibers, and you do that with shape. 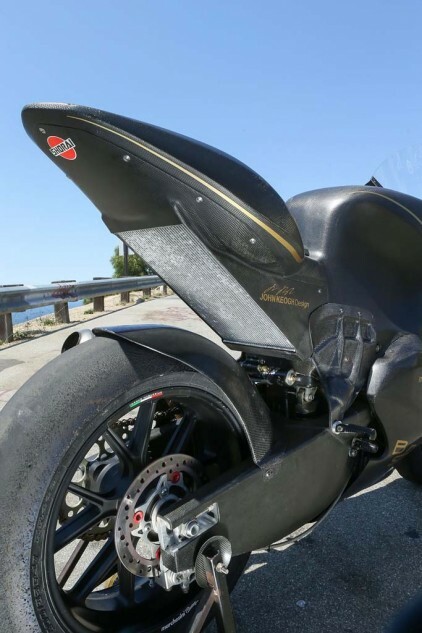 That’s why there’s such a large drop on the underside of the swingarm.” Once the torsional stiffness was where they wanted it, a new swingarm was made, using the minimum amount of carbon fiber necessary, to take advantage of carbon’s strength and lightness. Of course, working with carbon fiber isn’t cheap or easy. After all, these are just two guys working out of a small shop. “We had to develop techniques within our resources to achieve the results we’re looking for. And we’ve done that,” Taylor says. “We have a collaborator in England, John McQuilliam, who is the Chief Designer on the Marussia F1 team. His main responsibility is making the tub for the F1 car. He advises us on affordable testing techniques and he’s particularly good at showing us practical ways to test and get a very fit-for-purpose result.” McQuilliam’s help came especially handy when testing swingarms. 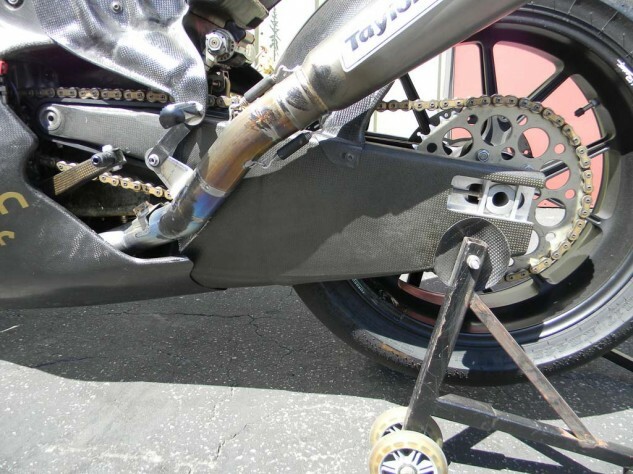 Testing revealed the original carbon swingarm would flex torsionally under load, causing massive front chatter. This, the fifth iteration of the swingarm, features a substantial cross-section of material in order to spread the torsional load over a large surface. To help with the sponsorship money, Taylormade has teamed up with an iconic brand looking to make a comeback: Brough Superior. It may seem a strange collaboration at first, but the two actually have a closer connection than one might think. As strange as this partnership might initially seem, the two parties share similar goals. Both Taylor and Upham want to bring their respective dreams to life. For Brough, recognition at the racetrack will hopefully lead to future road bike sales. For Taylor, he’s hoping the recognizable name will help attract further sponsors for the effort. 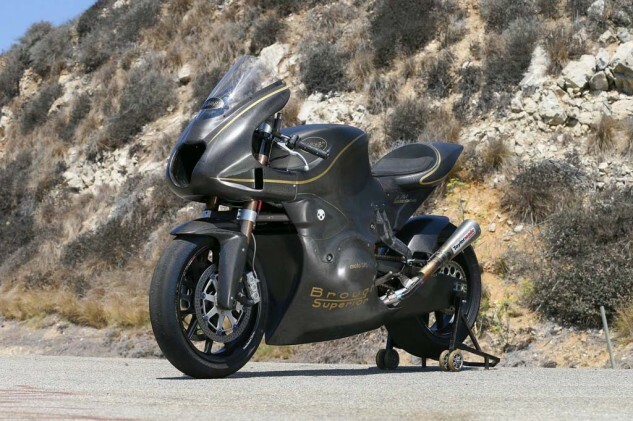 Legendary motorcycle brand Brough Superior is making a comeback and is partnering with Taylormade Racing to spread the word. Both parties hope the name will convince potential sponsor to join the effort to get this bike on the grid at the Austin Moto2 race next year. It’s a bit premature to be thinking about grand prix glory, but Paul Taylor has built successful motorcycles before. In 1995, his Saxon/Triumph won races in the international BEARS championship, even beating the famed Britten at Monza. 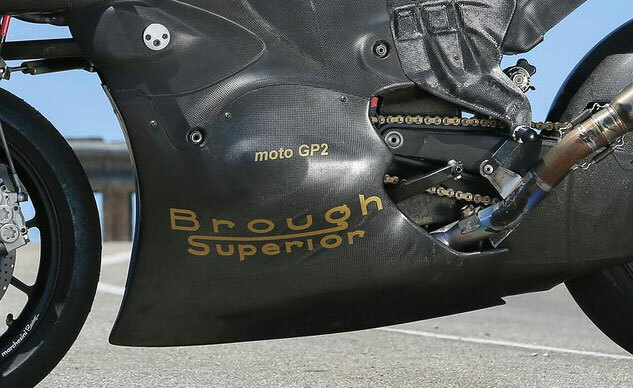 Right now, the team is looking to further refine the bike while securing the right rider and sponsorship program for a wildcard entry at the 2014 Grand Prix of the Americas in Austin, Texas. Assuming this project is successful Taylor says it would be dream come true but admits “We’re not a racing team.” One of the goals for the project is to hopefully show its potential. 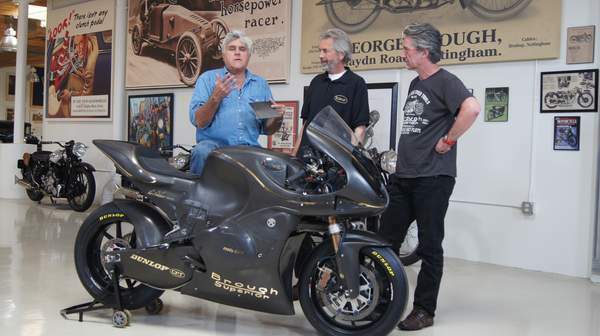 Jay Leno is a fan of what Paul Taylor (center) and John Keogh (right) have created. Here’s hoping that amounts to future success. However, Taylor and Keogh have more long-range visions for this project beyond racing. The two want to change the transportation industry in general. Taylor and Keogh have always dreamt big, and racing is about as high a target one can reach for. The two understand the effects racing can have in improving the breed, and ultimately it’s the most demanding proving ground for products the general consumer will enjoy in the future. The Moto2 bike could become the realization of racing success for the pair, and if that’s true, then the big winner is us, as trickle-down racing technology finds its way to benefit the masses.